Local MP Mary Macleod took the Communities Secretary, Rt Hon. Eric Pickles MP, on a tour organised with ISIS Waterside Regeneration around Brentford to see regeneration sites and the possible location of a new school. The potential school site, at Commerce Road in Brentford, has been championed by Mary and she has been working with stakeholders to get action. 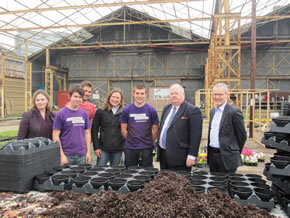 The Secretary of State’s visit also included a visit to the Brentford Lock West development by ISIS, during which he met ISIS apprentices and volunteers from Cultivate London. Following a tour of the constituency, Mr Pickles accompanied Mary to a lunch event hosted by Hounslow Chamber of Commerce at Sam’s Brasserie in Chiswick.